In this amazing capture by Tom Danneman (MRL 390 on Flickr), we see a northbound BNSF coal train heading across a fill just south of Bill, Wyoming. Danneman says the Powder River Basin where this was taken is a beautiful location for sunsets. The Powder River Basin is a geologic region in southeast Montana and northeast Wyoming, about 120 miles (190 km) east to west and 200 miles (320 km) north to south, known for its coal deposits. The region supplies about 40 percent of coal in the United States. 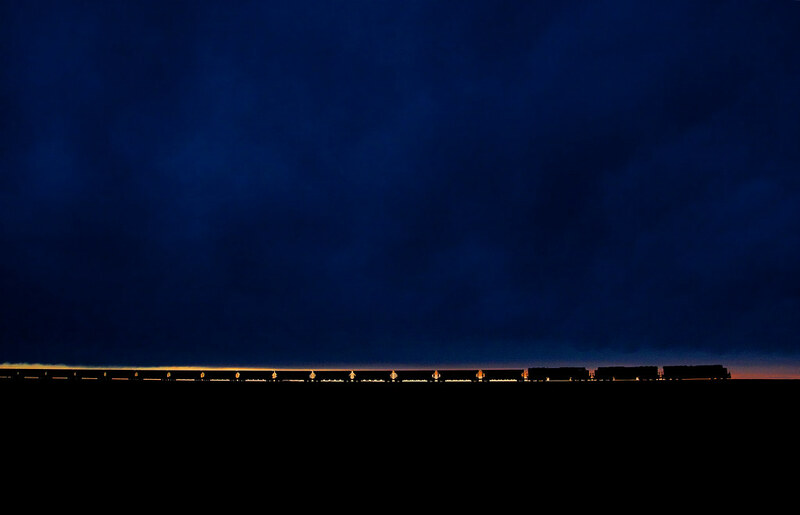 The BNSF Railway is the second-largest freight railroad network in North America, second to the Union Pacific Railroad, with a network of 32,500 route miles in 28 states and two Canadian provinces.